Public dissent over Gluckman Mayner Architects’ modernist-style proposal for the Contemporary Art Museum of the Presidio (CAMP) recently convinced Donald and Doris Fisher, founders of the Gap, to change architects. Last week the Presidio Trust released designs by the project’s new architects (and former associate architects), WRNS, that call for less new construction, retain historic buildings that had been marked for demolition, and substantially reconfigure the art museum. Two new buildings comprising the museum (and connected by an underground tunnel) will be relocated to sites that will soften the visual impact of new construction. The buildings have been designed to the scale of adjacent historic buildings on the parade ground known as the Main Post, and building materials have been selected to complement their palette. One of the new museum buildings, located south of Morago Avenue, will be buried, with only about six feet of its two-story height above ground. This portion will have a flat roof, with a planted retaining wall facade and small staff entrance. The other new structure, a two-story gallery building, will have only one of those stories above ground (limited in height to 30 feet) and oriented to the Main Post grid. This gallery building will have a broad overhanging green roof with three low-pitched sections. The north facade will be transparent with vertical glazing characteristic of other Main Post historic buildings, and will face a plaza. Porches and deep roof overhangs will serve to reinforce a sense of historic continuity. Meanwhile momentum still exists for the museum to be moved into the city of San Francisco itself, with Mayor Gavin Newsom, as well as the city’s Board of Supervisors, supporting the move. Last summer, the Presidio Trust had recommended the Fishers’ plan to build a $150 million museum for their collections alongside the Main Post, to be designed by New York–based Gluckman Mayner. A hodgepodge of historic buildings now stand on the site, including brick barracks from the 1890s and a Mission-style officers’ club. The Gluckman Mayner proposal was a two-story shifted glass box designed to mirror the formal geometries of the Main Post and echo the white-columned arcades of nearby barracks with vertical white mullions. In December, Donald Fisher agreed to consider major alterations, including moving to a site about 100 yards away. As for putting much of the museum underground, a spokesperson for Gluckman Mayner noted, “Don said from the start that he wanted to build a museum because he never wanted his collection to be stashed in basement storage.” He also added that it was “a bit of a surprise” to hear that WRNS, formerly the associate architects on the Gluckman Mayner scheme, was now redesigning the project. Could it be possible that Mr. San-Francisco-architecture Kenny Caldwell is tiring of the city? 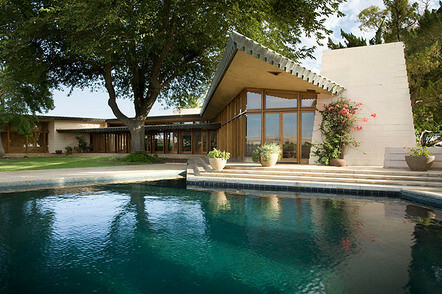 He is looking into the purchase of a spectacular Frank Lloyd Wright home in Los Banos, California, an “undiscovered” Central Valley town he calls “paradise.” The house was apparently commissioned in 1954, but not completed until 1961 (Wright died in 1959). It sits in the center of 76 “rich fertile acres” of walnuts and maybe beans (or is that cotton?) with 5 bedrooms, formalized ornamental screens, a koi pond, aviary, and tractor bay. This $2,700,000 “Usonian” dream may well be Kenny’s hideaway or castaway, but I bet his friends are already making plans to visit. That is, if they haven’t had their eye on a little Usonian Automatic of their own! 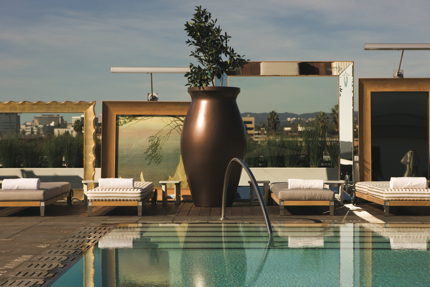 Frames encircling fine art and fantastic views of the Hollywood Hills are trademark Philippe Starck moves for the rooftop pool of the SLS. A slew of new hotels have debuted in California over the last year, riding what will likely be the last big wave of development for some time due to a slowing economy and dismal travel forecasts. They’re the lucky ones: The results from the November 2008 STR/TWR/Dodge Construction Pipeline show that 93,219 hotel rooms nationally have been abandoned in various stages of development, from preplanning to in-construction. That’s a 75 percent increase in such abandonments since 2007. Other data from the Pipeline also point to a slowdown: Through November 2008, 1,565 hotels nationally were in construction, down from November 2007, when there were 1,609 hotels in construction. In California, most new properties were a long-time-coming response to hotel room deﬁcits in many tourist-heavy areas. In Beverly Hills, for example, a luxury hotel had not been built from the ground up since the early 1990s, while in San Francisco, the 32-story InterContinental is the largest hotel to open in the city in two decades. 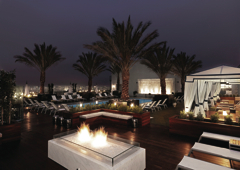 Two major California cities saw massive and much-needed room additions adjacent to their convention centers: the 420-room Hard Rock Hotel in San Diego’s Gaslamp Quarter, and the aforementioned 550-room InterContinental San Francisco, located near the Moscone Center in SOMA. (Los Angeles will have to wait until 2010 for its 54-story Ritz Carlton, part of the downtown development LA Live.) Across the U.S., this seems to be the case as well: The country has seen an exceptionally slow growth of only ﬁve percent in new rooms since 2001, according to the American Hotel & Lodging Association. This cautious expansion led to an age of conservative design for California hotels. Even the most anxiously anticipated debut in the state, the SLS Hotel—the ﬁrst venture into the hotel niche from nightlife wunderkinds SBE Entertainment (famous for their Philippe Starck-designed LA bars and restaurants like Katsuya, S Bar, and XIV)—went for wit and whimsy rather than over-the-top, cutting-edge design. It’s a huge departure from the sleek, cold modernism of the recent past—think the Standard or Mondrian of the late 1990s. A baroque moderne white-on-white palette at the SLS private lobby (top) and the hotel's rooftop pool (above), designed by philippe starck. “Instead of a very sparse, modern design, the approach we took is multi-layered in color and texture and decor and accessories,” said Theresa Fatino, chief creative officer for SBE. “Guests can come back over and over and feel that same sense of discovery, these feelings of rejuvenation and delight and wonderment and surprise.” This sensation—that they’ll discover another Starck design pun, or find a new favorite dish on José Andrés’ menu—aims at bestowing upon guests a feeling of belonging to some perpetual in-crowd. While the boutique concept is alive and well—Thompson Beverly Hills and London West Hollywood both nod aesthetically to their New York predecessors—these properties have seen the same style evolution, towards warm, sumptuous luxury and a sprinkling of nostalgia.“In the LA area, there’s a trend of capturing the glamour of old Hollywood and incorporating it into a design relevant to today’s lifestyle,” said Bryan Oakes of Gensler, project architect for the Hotel Palomar in the Westwood neighborhood of LA. The Montage Beverly Hills is modeled after the Mediterranean-inﬂuenced estates that sprang up in the city during the Golden Age of Hollywood, while Hotel Palomar and the London West Hollywood reference the same period with dramatic, sparkly interiors and Hollywood-referencing art. 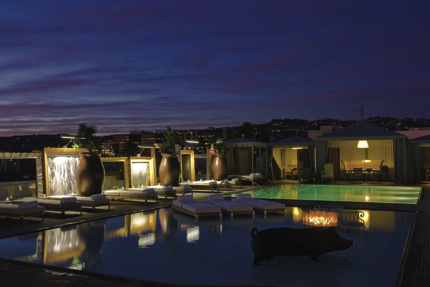 The Thompson Beverly Hills indulges a noire-ish theme, with deep, dark interiors that are signature of the designer Dodd Mitchell. Here, black leather upholstery, black lacquered wall panels, and glossy black wood ﬂoors convey Chinatown chic. 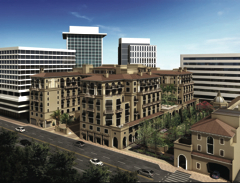 California continues to capitalize on the renovation of its older hotels by elevating former discount motel-like properties to luxury status, said Oakes. “One of the successes of Palomar is that we took a dated 1970s building, originally built as a Holiday Inn, and elevated it to a chic four-star hotel.” This seemed to work best for new boutique operations like the Thompson Beverly Hills, which inhabits a crisp white modernist box that was once a 1960s Best Western, and the London West Hollywood, a revitalization of a tired, nondescript Wyndham Bel-Age. 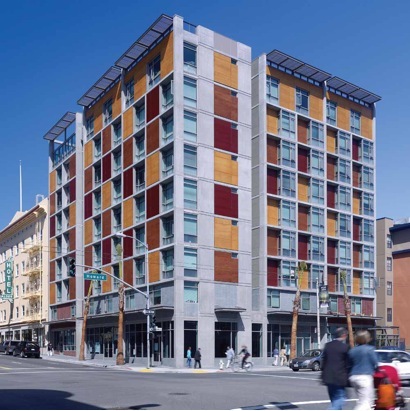 For the green-aspirational, a renovation could also be spun as a huge sustainable selling point: The Good Hotel in San Francisco combined two aging hotels into one eco-friendly property, complete with room appointments made from reclaimed materials and the option to contribute to a carbon offset program upon check-in. While the hotel pool has traditionally been the place for designers to show off, a growing emphasis is focused on creative public spaces that are twists on the hotel bar. Whether these are seamlessly melded indoor/outdoor lounges or multi-functional lobbies, designers are giving guests more reasons to come out of their rooms and hang out. “Trends ebb and flow, but I think that one area that should always be emphasized is that of the social gathering space,” said David Rockwell of the Rockwell Group, who calls for public spaces that are “open, transformable, and comfortable.” He outﬁtted the ﬁrst W’s for the Starwood chain and designed the Aloft (scheduled to roll out 500 locations worldwide over the next ﬁve years) with three major areas that encourage congregation and socialization: a communal lobby area with gaming and pool tables, the wxyz bar, and a 24-hour snack bar. The Bazaar at the SLS Hotel is broaching yet another approach: a warren of spaces blending bar, lounge, restaurant, and boutique for design retailer Moss, allowing guests to nibble and sip (and shop) in a variety of environments throughout an evening. 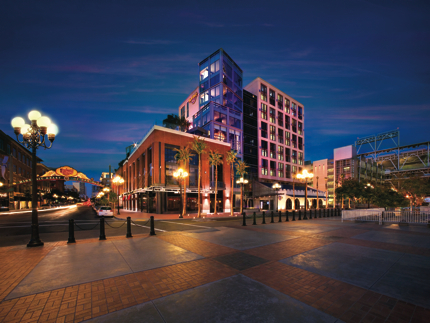 The Carrier Johnson-designed Hard Rock Hotel in San Diego's Gaslamp Quarter provides a transition to the city's fun-loving entertainment district. According to trend-tracking site HotelNewsNow.com, 2009 national occupancy is only predicted to dip slightly, down 3.9 percent, but that’s where the discount design trend might win over guests: In a December 2008 survey of business travelers by Orbitz for Business and Business Traveler, only half of the respondents expected to travel less in 2009, but 79 percent of travelers said they have been pressured to cut costs. For those hitting the road, there still might be a few new places to write home about. This year may well be the one that California museums wish to forget. Institutions are reeling from drastically reduced endowments: The Getty Trust in December told The Art Newspaper that its endowment has lost 25 percent since last June. Meanwhile, the Museum of Contemporary Art (MOCA) in Los Angeles was just delivered perhaps the most public blow of all: donor default. Exacerbated economic woes resulted in a massive drop in donations, forcing the museum to dip into its emergency savings. 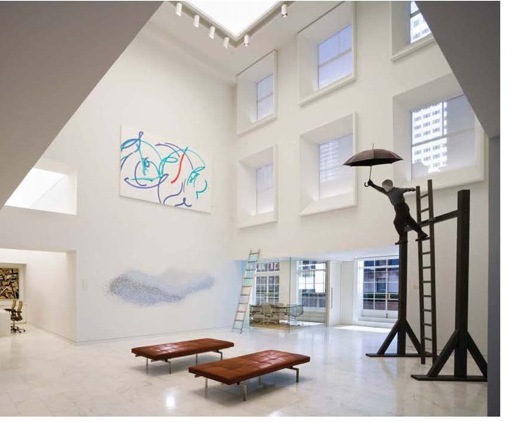 Financial strain has shuttered its Geffen Contemporary space for six months, and forced the resignation of Jeremy Strick, the museum’s director since 2001. After considering a proposed merger with the Los Angeles County Museum of Art (which is partially reliant on government funds), the museum accepted a no-strings infusion of cash from arts super-patron Eli Broad, who promised to match endowment funds up to $15 million. The museum also added a CEO position, naming Charles Young, former UCLA chancellor. The uncertainty of MOCA’s future has left many pondering the fate of architecture and design departments at museums throughout the state. But a closer look finds them faring far better than anticipated. MOCA’s architecture and design curator Brooke Hodge said she is continuing work on three planned exhibitions, as well as several major projects that are in development. The only significant change so far is to the next architecture exhibition, a survey of local firm Morphosis, which was rescheduled from its March opening to an August date. “It's too early to predict whether there will be any further impact,” she said. The museum also recently announced a renewed agreement with the Pacific Design Center, where MOCA has had a satellite location since 2000. The space will offer expanded programming with a greater focus on architecture and design, said Hodge. "My aim is to develop an innovative and inspiring program of exhibitions that touches on important issues and developments in the design disciplines both at home and abroad,” she added. Planned for 2009 are two exhibitions exploring the intersection of craft and computation: A site-specific installation by Ball-Nogues Studio, and Boolean Valley, an installation by architect Nader Tehrani of Office dA and ceramist Adam Silverman. 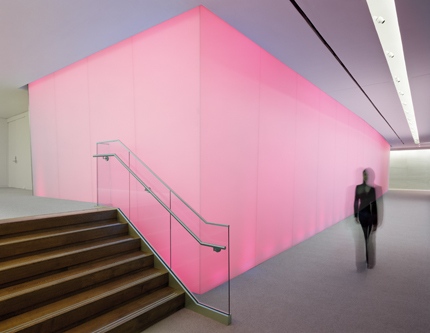 Meanwhile, the San Francisco Museum of Modern Art’s (SFMOMA) architecture and design department is in the midst of an acquisitions spree since Henry Urbach took over as curator of the department in 2006. An exhibition that closed January 4 showcased over 246 objects acquired by Urbach, as well as the decision-making process that went into each acquisition. It’s too early to know if that pace will change. If art prices go down, that might make acquisitions easier. For spring, Urbach has scheduled the first solo exhibition of the Berlin–based architecture firm J. MAYER H.
Another bright spot for architecture and design is at the Getty Research Institute in LA, which recently announced the formation of a design and architecture department. Headed by Wim de Wit and associate curator Christopher James Alexander, the department will curate the Getty’s already impressive holdings. These include Julius Shulman’s archives and the papers of architects John Lautner, Pierre Koenig, Ray Kappe, Daniel Libeskind, and Philip Johnson, as well as those of critics like Reyner Banham and unique acquisitions like the Bauhaus Papers and archives of the International Design Conference at Aspen. The first exhibition planned under de Wit’s tenure will unite many of these: a survey of California architecture from 1940-1990, tentatively planned for 2013 or 2014. De Wit will also launch a consortium for architects to share best practices, including practical information about the economy. “These will be to meet and learn more about each other’s works and see how we can help each other,” he said, adding that he is looking forward to more collaborations like the symposium organized in conjunction with the Hammer Museum’s John Lautner show last fall. While museums are busy saving themselves, chances are there will be less outreach to rescue endangered mid-century modern houses. A few years ago Michael Govan, then newly named director of LACMA, bandied about an interest in acquiring some mid-century architecture to help preserve it, a groundbreaking move. 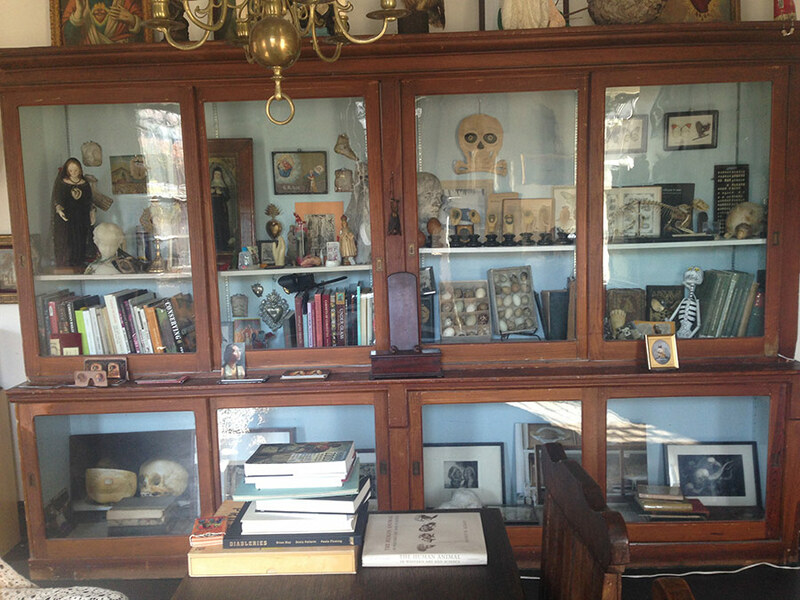 While LACMA has yet to deliver on such a promise, hope may lie in the strength and agility of smaller institutions: The LA-based MAK Center just added a third house to its roster, the Fitzpatrick-Leland House, designed by R.M. Schindler. Gluckman Mayner's proposal mirrored the geometries of historic quarters along the Presidio parade ground. 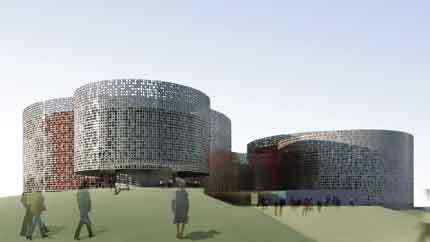 He added that the new design would include locating large portions of the museum underground and “significantly downsizing” the entire project, which was conceived as a work of contemporary architecture of the scale and stature of the de Young Fine Arts Museum in Golden Gate Park by Herzog & de Meuron. Last summer, the Presidio Trust, a federal corporation established to oversee the 1,491-acre national park, had recommended the Fishers’ plan to build a $150 million museum for their collections alongside a historic parade ground known as the Main Post, to be designed by New York’s Gluckman Mayner Architects. A hodgepodge of historic buildings from five different eras now stand on the site, including brick barracks from the 1890s and a Mission-style officers’ club. The Gluckman Mayner proposal was a two-story shifted glass box designed to mirror the formal geometries of the Main Post and echo the white-columned arcades of nearby barracks with vertical white mullions. On December 5, Donald Fisher agreed to consider major alterations to the Gluckman Mayner design, including different materials, a reduced scale with some portions underground, and the relocation to a site about 100 yards across the road. According to a spokesperson at Gluckman Mayner, “We worked with a large amount of flexibility. We were not pig-headed, nor did we say that it had to be white masonry and glass.” He added that the design was undertaken even as the Trust was still developing its design guidelines, further complicating the process. “The Trust was a partner in finding the site that we designed for,” the spokesperson said. “If we had all seen that a different site was a solution, we would have gone down that road.” As for putting much of the museum underground, he said, “Don said from the start that he wanted to build a museum because he never wanted his collection to be stashed in basement storage.” He added that it was “a bit of a surprise” to hear that WRNS, formerly the associate architects on the Gluckman Mayner scheme, was now redesigning the project. Calls to WRNS Studio had not been returned as of press time. Tourk said that a new scheme would be released in March. Grimshaw's Museo del Acero, in Monterey, Mexico, is one of nine winners in the architecture category. Today the AIA announced 25 outstanding projects in three categories—Architecture, Interiors, and Urban Planning—which exemplify the best work in the field to be celebrated by the 2009 Institute Honor Awards. Without further ado, here are the projects, grouped by category, along with the jury's thoughts as provided by the AIA. The jury for the award was chair David Lake, Lake | Flato Architects; Carlton Brown, Full Spectrum of New York; Michael B. Lehrer, Lehrer Architects; James J. Malanaphy, III, The 160 Group, Ltd; Paul Mankins, Substance Architecture Interiors Design; Anna McCorvey, director, AIAStudents Northeast Quad; Anne Schopf, Mahlum Architects; Suman Sorg, Sorg and Associates; and Denise Thompson, Francis Cauffman. Jury Comments: The architects expanded the space while making it appear as if the envelope is virtually the same. The jury applauded the efforts of mending our ways to restore, respect, and give new life to buildings by significant architects who are so important to the profession. Jury Comments: The project contains layers of symbolism. There is a sense of community and openness. The space shifts between heaviness and lightness. It is appropriately monumental but a reverie of light and shadow that is a gift to the City of Oakland. Jury Comments: This project uses elements in a thoughtful way to create a rich urban place. Smart use of its surfaces and resources and in keeping with the local conditions. The outdoor spaces are more comfortable because every piece of the building is leveraged to its best advantage. This could have been a monolithic program but instead the architects created an enlivened urban quarters connecting the campus to the water. Jury Comments: A true landmark and beloved building. People want to be here and want it to be active all of the time. 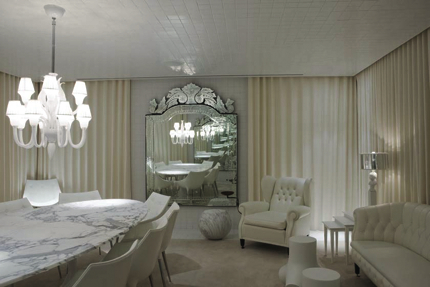 A new Modernism that uses timeless and topical ideas that look as if they will stand the test of time. Kudos to Gary Comer for giving back to his community and the architects for creating a tribute to his generosity and energy that benefits and uplifts this community. Jury Comments: This project is climate-responsive in six months out of the year in very clever ways. The architect was creative about the functions in the perimeter zones and how they interact with the campus. It changes the perception of what is the heart of the campus. Jury Comments: This is a proud symbol and testament to the steel industry in Monterey, Mexico. The architect brought back the artistry of artifact that was industry and gave it new spirit—embracing steel being made, fabricated, and enlivened. Jury Comments: There is an amazing serenity that emanates from the building in contrast to the chaos of its surroundings. The building is welcoming to the human at the ground level and wears its transparency proudly. 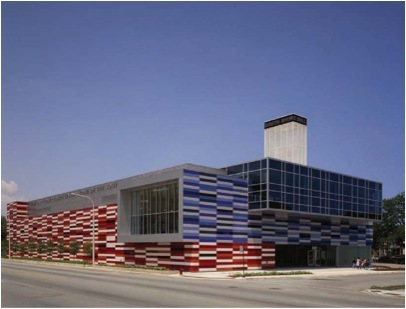 The jury liked the iconography of the building—it looks like lines of print and becomes like reading the Times. Jury Comments: The architecture has become a seminal event in the residents’ lives—residents remember the date they were first allowed to move in. 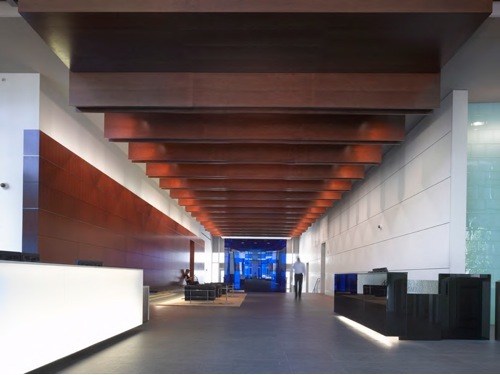 The architect created a series of “events” that happen in the lobby, courtyard, and in every hallway where there’s light—it’s really about optimism, hope, and change and the message that everyone is deserving of light, air, view, beauty, and proportion. Jury Comments: I believe this house makes a statement to living in a simple and sustainable way. The owners wanted to connect with nature, tread lightly on the landscape, and be able to relax. The jury for the award was chair Mark Sexton, Kruek & Sexton Architects; Joan Blumenfeld, Perkins + Will; Elizabeth Knibbe, Quinn Evans Architects; Arvind Manocha, Los Angeles Philharmonic Association; Kevin Sneed, OTJ Architects. Jury Comments:Very handsome, using wood and colored glass to great effect; the lighting is imaginative, and the relationship to the base building is resolved well. For a large office project, the architect showed an amazing amount of creativity and vibrancy. The lighting is frequently unexpected. The thinking about the use of light is out of the box and playful in what is not a playful project type. Jury Comments: Nice relationship to the existing structure. The jury applauded the sustainability efforts and the effort to bring light in. The reuse of the core structure space—concrete floors, etc.—is quite effective and was done in a very subtle way. On the ground floor, the building structure is revealed to great effect. Jury Comments: Without losing the original character of the building, this renovation transforms it. This is a difficult design problem solved elegantly. The narrow nature of the townhouse becomes a framework for beautifully composed public spaces that flow seamlessly. By linking them together the observer never has the feeling of being between the two long and dark party walls. Project: IFAW World Headquarters—Yarmouth Port, Ma. Jury Comments: From the initial selection of a brownfield site through the design of the spaces to the selection of materials, this project is a successful example of sustainable design. The reference to wooden boat making and craftsmanship is particularly successful to the design inside and out. Jury Comment: This project seems designed from the inside out with the users’ experience in mind. An enormous amount of thought was given to the individual users as to their experience inside the house. 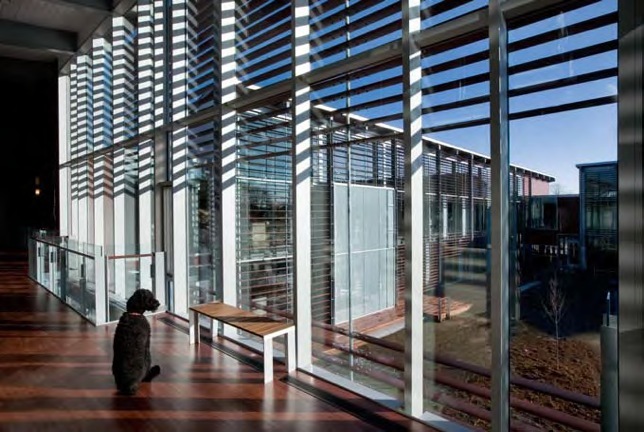 Natural light enters into each space in two to three different ways. Care was given to the optimal experience of moving from room to room. Jury Comments: The richness of detailing juxtaposed against the heft of the historic concrete structure was gutsy and effective. Creating a corporate interior that has such a completely unique aesthetic is rare and wonderful. Jury Comments: This project floats like the dancers who use it. 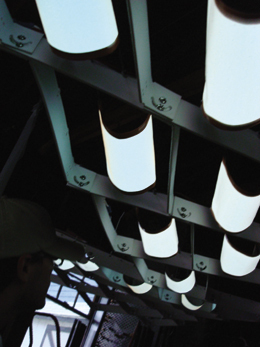 There is an ethereal quality of design and materials that relates directly to the users. The quality of light is wonderful. Muscular architecture; beautiful concept. Jury Comments: The architect uses the design to display the students and their work to give the campus its identity. Nice respect of historic façade while giving the school a clearly contemporary identity. Youthful, vibrant, dynamic! This project is hitting on all cylinders; it captures the energy of the student environment. Jury Comments: The design was very well done. It pays respect to the historic design and created a Modern design that is respectful of the original space. The architecture doesn’t compete with art work; it respects it without being a white box. Jury Comments: This is a terrific project! It takes the typology of town house and opens it up, creating wonderful spaces and vistas. 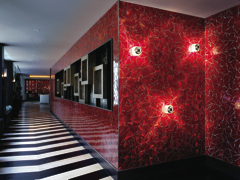 The materials and aesthetic is new and fresh, using bold color and simple materials without being cartoonish. It is a unique and imaginative take on a well-known design problem. It is refreshing to see how a traditional town house can be transformed through bold moves by a very talented architect. The jury for the award was chair Jonathan Marvel, Rogers Marvel Architects; Samuel Assefa, Chicago Department of Planning and Development; Tim Love, Utile; Ivenue Love-Stanley, Stanley Love-Stanley; and Stephanie Reich, Glendale Planning Division. Jury Comments: This greenfield development seems to fit in Fayetteville, particularly by Habitat in a scheme that truly employs innovative sustainable techniques in its management of all surfaces, integrated parking, circulation, and open space. 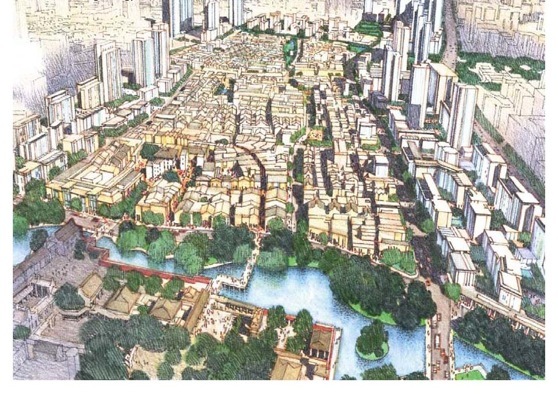 The site plan configuration achieves a level of density balanced by usable and varied open space, and the buildings are more varied than a typical Habitat development. Jury Comments: This project is beautiful and ingenious. Particularly, the attention to the existing landscape and topography as integral to the project by utilizing the existing hills as a structured landscape to return to nature, while the natural runoff becomes a body of water is a simple idea with a conceptual clarity to make it truly memorable. Jury Comments: The plan shows a variety of uses, scales and densities and open spaces that will serve to integrate the district with the surrounding city fabric. The proposal includes a set of guidelines for a variety of scales, heights and streetfront types that will enable implementation over time. Jury Comments: The project utilizes the underlying axis of the former airport, and juxtaposed the new gorge with a sensible structure of circulation for cars and people and placement of buildings. The use of the former runway as an inspiration and opportunity as a supergraphic creates an urban poetic gesture at a larger scale. Jury Comments: A formidable effort and comprehensive plan for a new neighborhood with a variety of districts. These districts are composed of different grains and densities allowing for varied economies, housing types, and uses. The welcome irregularities in the plan resulting from well-considered view corridors and idiosyncrasies in surrounding fabric create a wide variety of experiences and places. Jury Comments: An urban design strategy that is sustainable by its very nature. The project employs an inventive use of solar and wind pattern that generated an urban plan with diagonal grid to protect public spaces from the inhospitable winds. Other sustainable design strategies include an organic farm, wind turbines, location of open spaces as reconstructed wetlands. SOM's Poly Plaza building towers over Beijing traffic. As people tuned into the Olympics this past August, they saw buildings like the evocatively nicknamed Bird’s Nest and Water Cube settling into the Beijing landscape. But what wasn’t seen so clearly by Olympic viewers were the challenges of working in this frenetic setting, and the logistics of trading design drawings with clients and colleagues over five thousand miles away. It’s a world where technology plays a central role, increasing in importance and complexity. Without a doubt, the Chinese economy has been nothing short of miraculous over the last few years, turning a development nobody into one of the hottest markets in the world. Although new signs are ominous—a recent report in The New York Times said that housing sales in big cities this year have dropped by as much as 40 percent, and several firms told AN that commercial construction in the country is way down—China is still the place to be for Western architects, including many of California’s top firms looking for large-scale work. Among these entrepreneurial spirits constantly boarding flights that “would drive me nuts if I thought about it,” according to Andy Feola, president of Pasadena-based F + A Architects, technology allows the once time-eating, mundane coordination of cross-continental business to be managed electronically through innovative new data sharing, construction management, and teleconferencing technologies. “Working on projects in the early ‘90s, we would print up designs, box them up, and then have to schlep stuff over there. 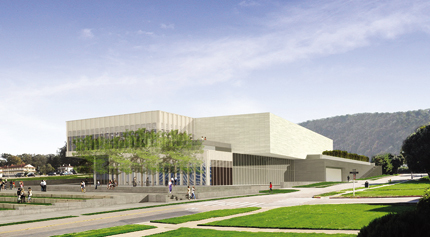 People were on the plane every week, information got lost in transportation, and it was prohibitive both in terms of cost and personal life,” said Mehrdad Yazdani, principal of Los Angeles-based Yazdani Studio of Cannon Design, which is now working on a concert hall, a restaurant, and a villa as part of the huge Ordos development that is employing star architects in Inner Mongolia. “My experience now is completely different,” he said. His firm uses the FTP site CuteFTP to share documents of all sizes; it employs Smarttech’s Bridgit software for WebExing—internet conferences in which users can interactively edit the same drawing—and it uses long-distance teleconferencing technology like Skype and the Polycom System (a hardware application linked to an overhead projector, a camera, and a computer image system) to conduct videoconferences with colleagues in China. Gene Schnair, managing partner of SOM’s San Francisco office—which is working on over 20 projects in China—noted his firm’s use of the Polycom system and GoToMeeting, which enables users in different locations to work on documents simultaneously, for teleconferencing. Morphosis, which is working on ambitious projects in China as well, uses the web-based project management system Aconex, in which the contractor in China posts drawings and images on the website for U.S. architects to review and send back with changes. For videoconferencing, the firm uses the Tandberg system, which like Polycom uses cameras and projectors to link teams over the internet. The firm’s videoconferences are further enhanced through the Cintiq tablet by Wacom, an LCD tablet imbedded in the firm’s conference tables that allows architects to instantaneously share sketches with their overseas counterparts. The firm also employs a software called Gathering Place, which displays architects’ desktops on colleagues’ computers in China. 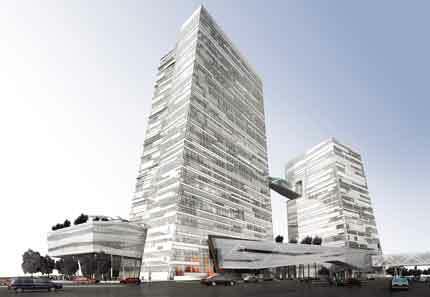 Joseph Wong Design Associates' BelQiao housing development (top) and a rendering of Morphosis' Giant Group Pharmaceutical Campus (above), both in the Shanghai area. There are still more work-saving and work-enhancing technologies on the way. A company called iBeam sells to architects and construction managers a handheld camera that beams live video from anywhere on a construction site to any computer screen; it can be shared by multiple remote viewers. And IT companies like Control Group provide comprehensive electronic tracking systems; or firms can do it on their own with software likeMicrosoft’s SharePoint, which allows huge document transfers from a central repository, with version tracking, vaulting, and other tools. Michael Mann, a principal at Los Angeles firm DMJM Design, also praised the financial benefits of sending some work to China. “Full-on 3D animations can get really expensive here, and they’re a third of the cost in China. It allows us to not only do better visualizations, but also to send work there for our U.S. clients that is otherwise too expensive to be done,” he said. Local companies like Shanghai-based Architectural Management on Demand (AMOD) can produce scale models and renderings within days using existing documents. Freeing up creative time can be crucial in a setting that’s often described as one of the most inventive in the world. Tim Christ, a principal at Morphosis, remarked that, “The Chinese are willing to embrace new ideas that you don’t see in the U.S. now, such as really ambitious spatial relationships. There’s a progressive spirit that’s extraordinary.” Morphosis is in the middle of construction of the Giant Group Pharmaceutical Campus just outside of Shanghai. Slated for completion in spring 2009, the 258,000-square-foot campus is a sinuous combination of lifted forms spanning a four-lane highway, a massive green roof, and cantilevered shapes anchoring both ends, one of which projects dynamically over a man-made lake. “There’s a willingness to push the envelope and explore different opportunities and directions,” agreed principal Robert Mankin, based in the Los Angeles office of NBBJ, whose firm is working on five projects in China, including a large mixed-use project in Dailian and a sports park in Hangzhou. A preview of NBBJ's Chinatrust Headquarters in Taipei, Taiwan (top), and Yazdani Studio's planned concert hall in Ordos, Inner Mongolia (above). Probably the biggest remaining challenge in China rests with the implementation of an actual design. Specifically, there’s still a large gap in construction standards. Although the level of quality is “much, much better; it used to be terrible,” said Jack Bouvrie, design director at Los Angeles–based firm Nadel Architects, there are still some concerns of overall ability with local engineering and construction firms, especially in cities outside Beijing and Shanghai. Because of regulatory limitations, American architects aren’t allowed to produce construction documents or act as architect of record without a local license, so they become consultants during the construction process. “At SOM, we’re still involved to the extent we can assure ourselves that our design is being carried out in a way that we’ll be satisfied with the outcome. It requires a watchful eye, from reviews of shop drawings to answering questions from contractors, to going out into the field for various visits. If that watchful eye isn’t there, chances are the quality will be problematic,” explained Schnair. 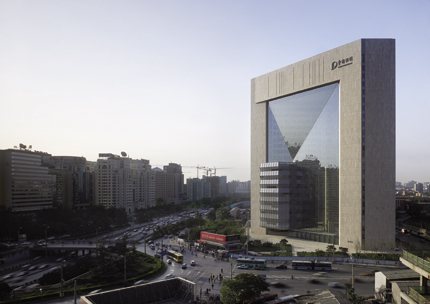 Other firms, like DMJM, have purchased architectural engineering firms in China with Class A licenses, thereby ensuring that they’ll be in charge of the projects from beginning to end. At the same time, projects in China—unbound by public hearings and slow approval processes—happen at accelerated speeds. That means that buildings are completed in China even before the working drawings are finished for most American projects. That much speed can compromise quality, however. As Bouvrie explained, “While I think it’s good that things get done quickly, the expectations are often unrealistic. You have a huge project, and the clients say they want to start construction in three months, and the project isn’t even designed, yet they start digging anyway. It’s really bizarre.” It can drive American architects slightly insane, as vocal clients demand completion of projects based on impatience rather than on realistic (and functional) schedules. And so, high-tech tools in hand, California architects continue to amass frequent-flier miles—or just travel electronically—as they pursue the profit in Chinese construction—and the dream of contributing to the next worldwide architectural sensation. On Election Day across the country, citizens registered their votes for major changes in the White House and Congress. But change will also soon come to California’s built environment, as several major initiatives facing California transit, infrastructure, and development were approved or denied. On the statewide ballot, Proposition 1A passed with 52.3 percent approval, meaning a high-speed train linking San Diego, Los Angeles, San Francisco, and Sacramento—and most major cities in between—could be ferrying passengers at speeds of up to 220 miles per hour by 2030. While a whopping $9.95 billion in state bonds was allocated by the proposition, development cannot continue until matching funds are secured from federal, local, and private sources. A business plan for the program was released on November 7, equating it in scale to the State Water Project, the world’s largest public water and power system, funded by a 1960 bond measure. California High Speed Rail Authority chairman Quentin Kopp called the proposition’s approval a “21st-century golden spike." Once funding is secured, the Authority will focus first on the LA-to-San Francisco “backbone” segment. Environmental impact reports have been completed for the route and alignments chosen, with the exception of the Northern Mountain Crossing connection between San Jose or Oakland and the Central Valley. In Los Angeles County, another major transit proposal, Measure R, reported 67.93 percent voter approval when a 2/3 majority was needed. The 30-year, half-cent sales tax increase will fund improvements and expansions for light rail and subway lines, HOV lanes, freeways, and traffic reduction. According to Metro spokesman Rick Jager, the tax will go into effect next July, and citizens could start to see evidence immediately, since a portion of the funds will go directly to LA-area city governments. “The local return is an important element because these 88 cities will start getting their 15 percent share from the tax that’s generated,” he said, noting that many cities had plans for street resurfacing, pothole repairs, improving left-hand signals, pedestrian improvements, and bikeways. It also postpones a planned Metro fare increase to 2010. The rest of the funds generated by Measure R will be available in 2010, when the major projects up for funding will be an extension of the Gold Line that goes to Azusa (the first six-mile extension of the Gold Line, begun in 2004, is on budget and on schedule to open in the summer of 2009), the Green Line extension to LAX, and the second phase of the light rail Expo Line stretching from downtown LA to Santa Monica. The first segment of the Expo Line’s route from downtown to Culver City is scheduled to open in 2010, and with this burst of funding, it could reach Santa Monica as early as 2013. Later, funding will become available for the Purple Line or “Subway to the Sea” extension in 2013. After Beverly Hills’ city council approved a 12-story, 170-room Waldorf-Astoria hotel and two condo buildings on the site of the Beverly Hilton in May, opposed residents gathered enough signatures to put the decision on the ballot as Measure H. After results were too close to call for several weeks, on December 2 the city certified that Measure H had been approved by 129 votes, meaning that an architectural design review and tract map will move forward as planned. In San Francisco, Proposition B, which would have required the city to set aside 2.5 cents for every $100 of assessed value over the next 15 years for affordable housing, failed 47.4 percent to 52.6 percent. This was disheartening to housing advocates and the city’s Board of Supervisors, who strongly urged its approval to prevent what they called an “affordable housing crisis” due to budgetary concerns. Proposition B would have allocated $30 million to help house those making less than $18,000. According to housing advocate Calvin Welch, the budget currently only reserves $3 million for affordable housing. Mayor Gavin Newsom was one of the strongest opponents of Prop B, arguing that it was unnecessary. And while its outcome did not directly impact architects, another Measure R, this one also in San Francisco, was certainly a topic of conversation for anyone working in infrastructure: This ballot initiative that would have renamed a Bay Area sewage plant in honor of President George W. Bush was soundly defeated.